Teaching Tidbits Blog: Teaching Tidbits is the new blog hosted by the Mathematical Association of America, and authored by math teachers. 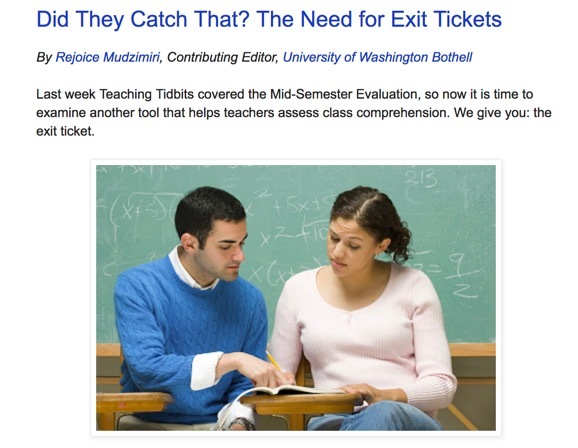 The posts are geared toward undergraduate classrooms but also could be used by K-12 teachers. As they note, “each post can be read while you walk to class and implemented within minutes” (although we recommend paying attention to where you’re walking rather than reading your phone!!). If you have an idea to share, you can email your tip to: teachingtidbits@maa.org. Lew Ludwig, of Denison University, is the editor-in-chief of the blog. Want to keep up with news on teaching and learning in higher education? Want to publish your research or opinions on higher ed (other than on this site!)? Here’s an impossibly complete list of journals, newsletters, and on-line sites on the subjects of teaching and learning, pedagogy, and education, provided by Kennesaw State University’s Center for Teaching and Learning. And, when you’re tired of reading and want to go to a conferences, the CETL also provides a remarkably complete directory of conferences and workshops on teaching and learning. Both of these sites, by the way, are searchable by discipline and topic (for the journals), and city, state, country, discipline and topic (for conferences). One of the most serious issues that has emerged in the last presidential campaign is the question of fake news. For academic institutions, the question raised is whether we are building the capacity of our students to fully assess news sources, whether they agree or disagree with the content those sources provide. A number of organizations are continuing to address this issue, including the Association of College and Research Libraries (see, for example, their Framework for Information Literacy for Higher Education). One approach to the issue is provided by Project CORA (Community of Online Research Assignments), originating in the Loyola Marymount University Library. CORA provides an open access way for faculty to post assignments with particular concern for information literacy. Check out, for example, an assignment offered by a faculty member at Radford University, “Evaluating News Sites: Credible or Clickbait.” Besides presenting learning outcomes (Students will be able to identify characteristics of credible news sources; Students will critically examine news sources to determine credibility), the online assignment offers information on how to design, evaluate, and discuss the assignment, as well as course content, relevant links, and potential pitfalls. (1) Develop and publish an online resource hub for oral history and digital scholarship/storytelling framed in three parts— Practice (pedagogy for engaging in community), Analysis (pedagogy for building, exploring, & excavating the archive), and Publication (pedagogy for impactful storytelling)— using ‘high impact’ and experiential learning frameworks. (2) Establish and promote workflows and technological options for visualizing, processing, preserving, and sharing field recordings that result from community-based learning. (3) Promote and recruit applicants for a series of Call for Proposals to provide micro-funding and support for demonstration project teams from GLCA colleges to ensure adoption of the toolkit, trainings, and repository options curated by the initiative. (4) Devise and enact outreach strategies across teaching-focused campuses, and coordinate trainings and workshops. The project is under the direction of Brooke Bryan (Antioch College) and Ric Sheffield (Kenyon College). Digital Scholarship: Pedagogy and Projects, a project of the Five Colleges of Ohio (Denison, Kenyon, Oberlin, Ohio Wesleyan, Wooster), with funding from the Andrew W. Mellon Foundation. In the first year under this grant, Ohio Five Digital Scholarship focused on building relationships and then establishing and testing the workflows under which projects would grow. 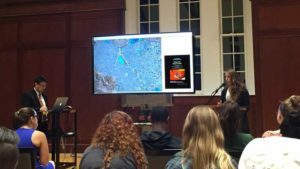 In its second year, there was a shift to active project development and, where possible, plugging the efforts of #oh5ds into the larger landscapes of DS in the Liberal Arts, Digital Humanities, and Digital Scholarship writ large. The website gives access to on-going digitization projects at all five colleges, as well as faculty guidelines for potential projects’ parameters and about the libraries preparedness to partner on projects. “Teach Visual,” a GLCA-developed website provides easy access to examples of pedagogy used in object-based teaching. Given that the fundamental role of academic art museums/galleries is to teach from objects, four GLCA academic museums/galleries collaborated to create a centralized web repository and portal that shares best practices for object-based learning in a higher education, liberal arts context. This pedagogical tool will enrich and advance scholarship, and assist in teaching across multiple academic disciplines. TEACH VISUAL was developed by faculty and museum staff, and contains contributions that focus on collaborative teaching and learning across disciplines. It includes teaching resources such as syllabi, lesson plans, assignments, and other pedagogical tools for object-based learning.